The easiest to grow, starchy vegetable is the Jerusalem Artichoke. This vigorous relative of sunflower, tobacco, tomato, and potato is a member of the Nightshade family. It is raised to produce eatable roots. It is started from root cuttings, like potatoes, and forms tubers in the fall. A sunny site, with sandy or humus soil should be chosen for a permanent bed. Barriers like a driveway or stone wall prevent it from taking over a large area. It will spread out in all directions from each and every root. Your first harvest can begin after the tops die back for winter. Dig in spots scattered throughout the bed. The tubers are sort of knobby and skinless, and you will recognize them as being like what you planted. They keep best right in the ground, and can be dug anytime it is not frozen. To get your bed established, you may need a thin layer of mulch over the whole area for the first year or two. Soon the tops will provide that by themselves. For a large harvest, you should be feeding the soil by adding some composted manure or fertilizer in the spring. For a winter harvest, protect a strip in the bed from freezing by adding a thick layer of mulch. Move the strip each year so that the roots will fill back in. Jerusalem Artichokes can survive with no attention for many years, awaiting your need to eat them. That makes it ideal for establishing a bed at your summer cabin or retreat location. I will have to be honest, I like potatoes better. But any food that grows in permanent beds, requiring little care, is very good to have around the homestead. Native Americans grew Jerusalem Artichokes widely in areas where there is enough rainfall for corn to be grown. 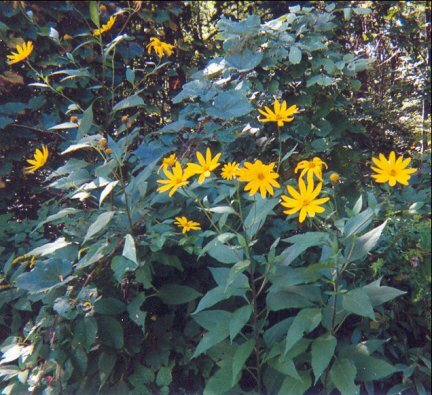 Jerusalem artichokes were also used by settlers to help in clearing forests into pastures. They cut off all the trees and brush, and fenced the area for pigs with some of the drying logs. Then a crop of Jerusalem artichokes was planted and allowed to grow for a year. Using iron bars to make holes, ears of dry corn were driven deep under stumps and rocks, and a herd of pigs was turned into the field until fall. They do a wonderful job of digging up, and fertilizing the whole field. They also loosen up all the stumps and rocks. The dry logs could then be used for other things, the rocks made into permanent stone walls, and the stumps burned. The field is ready to plant corn. The reason Jerusalem Artichokes got the nickname of poor man's potatoes is they can be harvested with little planning and work. I think real prosperity always comes from good planning and hard work.